This private sightseeing tour shows you the best of Los Angeles including frequent stops. Your driver will pick you up at your hotel in the Los Angeles area and take you to the Getty Museum where you can explore the Modern Outdoor Sculpture. Then drive through the City of Angels, stopping at the Walk of Fame. Drive by celebrity homes in Beverly Hills, designer shops on Rodeo Drive, the iconic Sunset Strip, and the Hollywood Sign high above the city within Griffith Park. Your round-trip hotel transport,Snacks water and $5.00 Subway Gift Card are covered. Enjoy the sightseeing with your group of the beautiful City of Los Angeles. Stop for 1 hr and look for the foot prints of your favorite Celebrity Stars on the Hollywood Walk of Fame. See Madame Tussad's Wax Museum, Hard Rock Cafe, Dolby Theater the new home of Oscars and many other fun attractions along world famous Hollywood Boulevard. Enjoy complimentary snacks and bottled water. Go inside Griffith Park, one of the largest urban parks in North America, looming high above Los Angeles. Stop for 30 min to take pictures in front of the Hollywood sign with incredible city views. Drive by Beverly Hills, Ride over to upscale Rodeo Drive and stop for 30 min wherever you like to browse or shop. Stop at Getty Museum where you can spend 1 hr and explore the Modern Outdoor Sculpture. The Fran and Ray Sculpture Collections, Modern British Sculpture. Keep your camera ready and take lots of pictures of your friends, and families at The Fran and Ray Stark Sculpture Garden which is beautiful and must see. 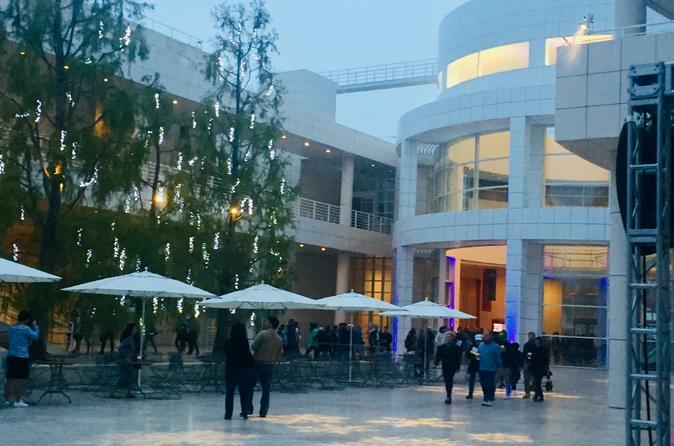 Watch the Orientation Film and Self Guided Tours where you can Explore the collection and exhibitions for Free at the at the Getty Guide Desk in the Entrance Hall. Your round trip hotel transport, snacks, water and $5.00 Subway Gift Card are covered.